This collection of articles is particularly interesting. It covers practice at the Indianapolis Motor Speedway on May 23, 1911. 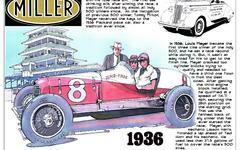 Big names were blasting around the track: including David Bruce-Brown, Billy Knipper, Ralph Mulford, Caleb Bragg and Fred Belcher, whose drive in the first Indianapolis 500 is the subject of a book from the Belcher Foundation. Also in this package is a neat little article on how Case star Lewis Strang - who, by virtue of filing his entry first would start first in the race - drove Indianapolis Mayor Samuel Lewis Shank for a couple of speedy laps around the vitrified brick oval. A final article stresses that there were plenty of seats left for the race, despite rumors of a sellout. These were for grandstands, as no one expected the general admission tickets for the infield to overflow.